Following on from Part One and Part Two, I humbly present Part Three of my "On Heroic Greek Characters" series, and it's all about that cunning Ithacan, Odysseus. Favoured by the gods, especially Athena, Odysseus is really the model for all Greek Heroes. Odysseus was initially reluctant to join the Trojan War, going to the length of faking madness in an attempt to get out of it! This was less a cowardly act, rather a kingly one, preferring to remain in Ithaca with his wife and newborn son. His ruse was uncovered, and he was honour bound to travel to Ilium to be part of the war. During the war, Odysseus fought with much honour, both as a leader of men on the battlefield, but also enacting guerrilla style raids against the Trojans with Diomedes (the second most cunning of the Achaeans). Odysseus and Ajax were the ones to recover Achilles' body after his death, both claiming his armour as their own. So a challenge was undertaken, which Odysseus eventually won. Although Achilles was the "best of the Achaeans", the position as second best fighter was a bit more disputable. In Part 2, I gave that title to Ajax; as his victories were done without the help of the gods, as well as he was the only other Greek Hero to encounter and best Hector the breaker of horses in single combat. However, Odysseus does have to lay claim to that title too, he was able to draw a wrestling match with Ajax (with Athena's help). His primary reason for fame at Troy was the Trojan Horse itself. Odysseus was the one to come up with the cunning ruse and was also one of the fighters inside of the horse. The ruse was simple, war had been on the shores of Illium for years, so the Greeks would feign withdrawl of their ships, leaving behind a large statue, dedicated to the gods to grant them safe passage home. Instead, the ships sailed off out of sight, and the offering was filled with armed Greek soldiers! 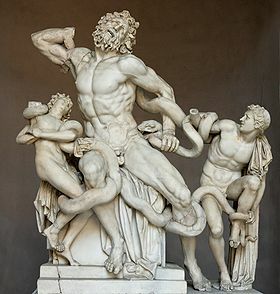 It was only one of the Trojans who anticipated foul deeds, the High Priest Laocoon. Luckily for the Greeks, Athena was on their side, and so sent two sea snakes out of the ocean to kill both Laocoon and his two sons. The Trojans took it as a sign, and took the horse inside. The rest, as they say, is history. After the Trojan War is where the real adventure for Odysseus begins, at the start of his 10 year Odyssey to get home to his loving wife Penelope, who is beset by suitors searching for her hand in marriage! Odysseus sets sail for home, but Poseidon is a little cranky at the whole dead Trojan thing (he was a fan of them), so he takes it out on Odysseus by sending him basically everywhere in the Aegean but home! Odysseus had many adventures on the way home, but I will recount just one here which speaks much about his character (if you want to know more, stop being lazy and read the Odyssey!). The first is when Odysseus and his men became stranded on the island of the Cyclops, Polyphemus. 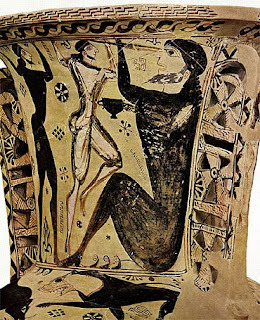 Odysseus and his men became trapped in Polyphemus' cave, where upon the Cyclops began eating Odysseus' men for dinner. 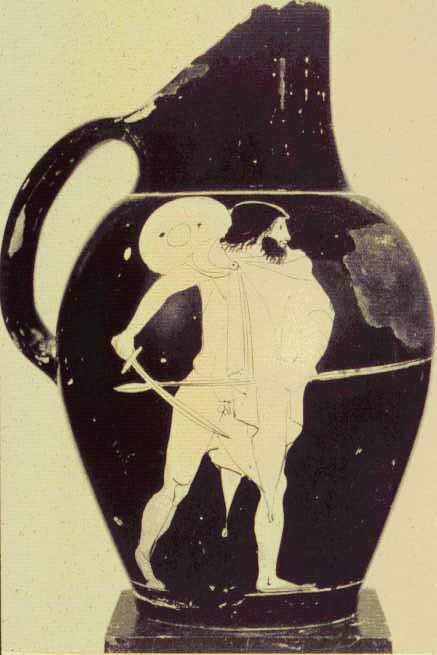 Odysseus tricked him, by making him drink a bit too much wine, and passing out. Odysseus was unable to roll the boulder away from the door, so instead blinded Polyphemus. Odysseus taunted Polyphemus, saying that "Nobody" had blinded him, making his cries for help ridiculous, ensuring no other Cyclops would be drawn to the cave. This allowed Odysseus and his men to escape wearing the pelts of sheep, as Polyphemus did open his cave to let his sheep out. As Odysseus sailed away, he yelled that it was he, Odysseus who blinded him. On the surface of it, it was a dumb move. Polyphemus cursed his name, getting his dad to wreak some vengeance on him (his dad was Poseidon). But this incident relates to what was discussed in Part 1, that Greek Heroes had a pathological desire to be remembered. Odysseus then, deliberately opens himself up to harm, simply to be remembered. He goes on to lament the ignobility of dying in a shipwreck, lost at sea. In fact, without a proper burial it was believed that the shades (spirits of the dead) were unable to enter the underworld. When Odysseus finally returns home after spending 7 years with a nymph, Calypso, a year with the Sea Witch Circe, seeing the Sirens, avoiding cannibalistic Cyclops, visiting the underworld, avoiding Scylla and Charybdis, visiting the Phaeacians, accidentally eating the cattle of the Sun God Apollo and getting hit by a thunderbolt for it; Odysseus finally returned home. But all had not been well in the around 20 years he had been away, his son, Telemachus had grown up (and had his own adventures in the Odyssey. You should read it). His wife Penelope was at her wits end, trying to get rid of suitors for her hand in marriage. The suitors were attempting to eat her out of house and home, and are generally portrayed as totally reprehensible characters. Odysseus does not return in glory, he adopts (with Athena's help) the guise of an old man, to check the lay of the land and to check her intentions. She had been faithful to him (not like he was to her), so he creates a plan to be rid of the suitors. A competition is set up to decide the best of the suitors, shooting an arrow from Odysseus' great bow through 12 axe heads. All of the suitors attempt, and fail to even string the bow. Telemachus has a go, and would (probably) have succeeded, had Odysseus not intervened. He took the bow, strung it, shot the arrow through the axe heads, then turned the bow onto the suitors. Odysseus' plan was ruthless, all the weapons were hidden earlier, the doors were locked and boarded and he and his three helpers (a shepherd, his son and his dad) they slaughtered the suitors. It was the ultimate sort of action movie endind, he reveals himself to his love lorn wife, they embrace, roll credits. Of course, the suitors families are a bit unhappy, but again, Athena comes through to calm everyone down. For more about this, really, really do read the Odyssey. But, for SAGA, here is my take on Odysseus. I decided to show him with the traditional Greek Statue head, with his helmet atop his head. The shield design is an owl, Athena's favorite animal. The model was converted from an Immortal Games hoplite, with his right arm taken from an Ancient Briton. The two hoplites flanking him are some Ithacan Royal Guard. I needed 2 different looking hoplites for Impetvs, to show an elite hoplite base, so I made these two guys up. The one with his shield up has his arm from an Ancient Briton (again). I thought writing about Odysseus was going to be easy, the Odyssey was the first classical text I ever read and Odysseus is one of my favorite characters, but writing all this down was much harder than I thought! If you have an idea which Greek Hero I should make next, add it to the comments. Great stuff, Chris! I really like that you have him with his helm pushed back on his brow as it makes him stand out (being such a crafty hardass and all).